Pasta is one dish I never order in a restaurant because it’s so easy and inexpensive to make at home. Like this Chicken Alfredo. The most time consuming part of this dish is cooking the pasta. I make mine with angel hair because the sauce sticks to the noodles more. I use chives because we have them in our garden. It’s not worth buying chives for this dish, so the chives are optional. 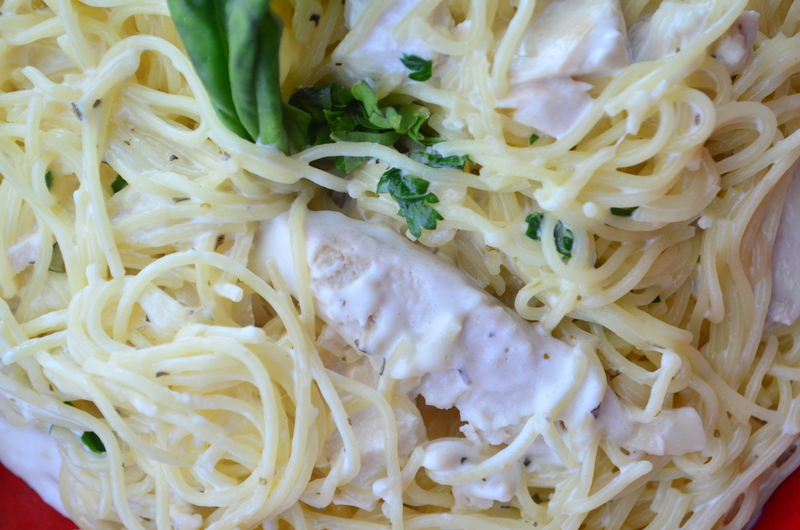 Also, I love basil in alfredo but you can skip it if you’re not crazy about basil. Do not salt your sauce until the end because there is a lot of salt in cheese. This dish comes together quickly at the end, so have everything prepped. First, put water on to boil for pasta. Then remove the chicken breasts and the skin and chop chicken into chunks and set aside. Slice basil and chop parsley. Cook pasta according to aldente directions on the box, strain and set aside. In a large skillet , heat butter and garlic for 1 minute. Add heavy cream and cook over medium heat for 5 minutes, stirring constantly. Add Parmesan, chicken, pasta, parsley and basil. Cook 2 minutes until sauce sticks to pasta. Garnish with fresh basil and chives, if desired. Serve immediately. This photo does not do this dish justice. Just know it’s delicious! This entry was posted in Pasta and tagged alfredo, basil, cheese, chives, cream, dinner, easy, family, fast, parmesan, pasta, quick, rotisserie chicken, weeknight on March 30, 2015 by Juliana Goodwin. It’s not chicken, but it’s delicious. For the next few days, I am taking a break from my rotisserie chicken and sharing some great Easter desserts with you. These macaroon nests are the BEST macaroons I’ve ever tried. If children are going to be part of the celebration, you have to try my macaroon nests. These are absolutely delicious, and so easy for children to make. There’s only five ingredients and you mix it by hand, so you don’t have to mess with a beater and there’s no flour to spill all over the floor. If the cookies don’t bake up into perfect rounds, when you take them out of the oven, you can shave off any edges and reshape them slightly while still warm. My recipe only makes about 10 cookies, but they are good size and the recipe can easily be doubled if that’s not enough. Once you’ve filled the macaroon nests with jellybeans or a candy egg of your choice, them place them on a long platter and use it to decorate the center of the table. If you don’t like the idea of food dye, leave them white. In a large bowl, whisk egg white for 20 seconds, until frothy. Whisk in vanilla and condensed milk and food coloring until combined. Stir in coconut until combined. Spread a piece of parchment paper on a cookie sheet. Spoon about 1 ½ to 2 tablespoons onto parchment paper and form a nest. Use your thumb to press gently down on the center to make an indentation so you can fill it later, but be sure not to press all the way through. You just need a little spot in the center. If you press through, the cookie may not hold its shape. Bake for 18-20 minutes. Cool before placing candy eggs in the nest. This entry was posted in Desserts and tagged baskets, children, coconut, cookie, cooking with kids, dessert, Easter, easy, eggs, family, fast, gluten free, kids, macaroon, simple, sweetened condensed milk on March 25, 2015 by Juliana Goodwin. Woo Hoo, I did it! 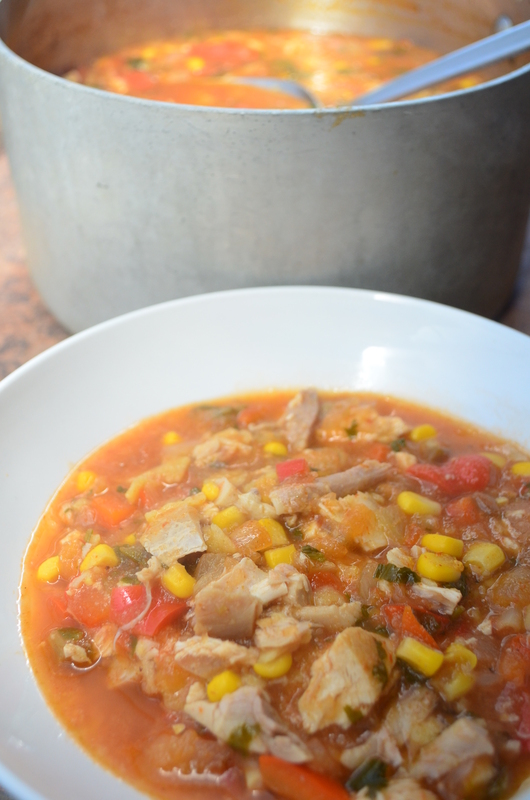 Revamped my delicious chicken tortilla soup and transformed it into a wonderful Rotisserie Chicken Queen soup. From start to finish, it took me 25 minutes! My old version took about an hour and a half and this new version is spectacular! It has more ingredients than most of my recipes but it’s still easy. If you enjoy the flavors or cumin, cilantro and corn, you should love this. And it freezes beautifully, so if you are single or travel a lot, you can easily freeze it. There’s about six servings in a pot and I ran the ingredients through one of those calorie calculations, and it has 311 calories a bowl. It was rated B+, which is awesome, so it’s nutritious as well as delicious. It has 12 percent of your daily recommended intake of iron, 48 percent vitamin C, and 20 percent vitamin A. If you made my Mexican Lasagna, you probably have left over corn tortillas, so you can use them in this. For future reference, corn tortillas freeze well, too. You’ll notice, I give directions as if I am there with you in the kitchen because I know where the pauses are in my recipe and it helps you move faster. You don’t have to de-bone the chicken before you start the soup. If you do, you will add a little extra time to the 25 minutes I said it takes. I try to be as efficient as possible with whatever I make. “Efficient” is a commonly used word in my home and is usually greeted with a mental eye-roll from my husband. I don’t blame him. I strive to be more efficient with everything I do. This is one efficient, yummy venture. I hope you enjoy it. *If you want to save time and you’re not cooking with dehydrated garlic, you need to buy some. It’s awesome! I tried it when I visited the New Orleans School of Cooking and I was skeptical, but instantly won over. Now I only use fresh garlic if I am making a dressing or something that must have it. Dehydrated garlic saves me time, effort and I don’t have stinky hands. You can order it online, but I recently bought some from Big Lots, of all places. It was inexpensive, too. I’d call your local store before heading over. First, chop onion and red bell pepper and set aside (use a food processor, if you have it). Split a head of cilantro in half and cut the stems off one half. Then bunch up the leaves and slice those and set aside. In a large pot, heat the oil over medium heat. When hot, add onion, cumin, chili powder and cumin seed. Stir occasionally while it cooks for about 7 minutes. While that cooks, do the next steps but be sure to stir the onion so it doesn’t burn. Pile tortillas on top of each other, slice them and then cut into small squares and set aside. Tear the meat off your chicken. Discard the skin or save it for another use. Coarsely chop the chicken and set aside (if you have time; if not, you will get to that in a second). When onion is tender, add all the ingredients from the bell pepper through the salsa. You do not want to add the chicken yet because it’s already cooked. 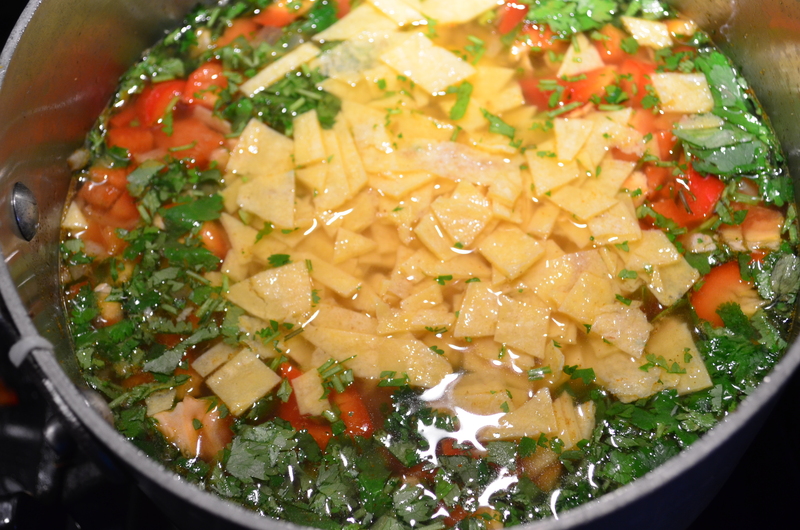 Bring soup to a soft boil and cook 10 minutes. When soup has cooked 10 minutes, drop chicken in and turn off the heat. The soup is piping hot and will quickly heat the meat. See how creamy the soup looks now? Transformed in 10 minutes. Optional: Serve with a slice of avocado, crumbled up tortilla chips, cheese or plain. The calories calculated were plain. Stir the soup and serve. 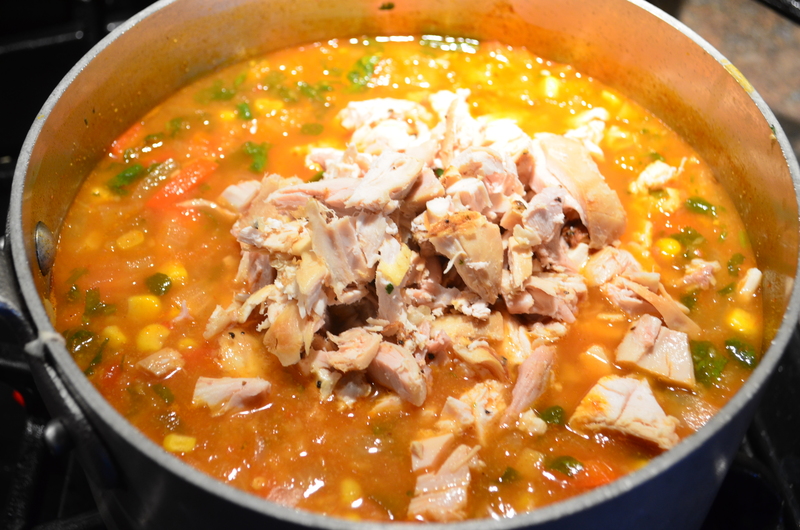 This entry was posted in Juliana's Favorites, Soups and tagged cilantro, corn, cumin, dinner, easy, family, fast, healthy, low calorie, mexicanm, rotisserie chicken, soup, southwest, tortilla on February 2, 2015 by Juliana Goodwin.